0.500" (12.70mm) dia x 0.189" (4.80mm) thick. Set of 50 pcs. C8 Ceramic Disc Magnet, Magnetized through the thickness. Not plated. Ferrite disc magnets are great for use in many applications, which include use as motor magnets, sensor magnets, hobby magnets, craft magnets, consumer electronics magnets, and speaker magnets. Ceramic magnets can operate in high temperature applications where a strong magnetic field is not needed. These ferrite disc magnets can be manufactured with the direction of magnetization through the thickness or across the diameter. Some ceramic / ferrite magnets are made as isotropic, which means there is no defined magnetic orientation during the manufacturing process. 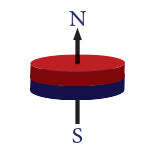 These isotropic magnets are mainly Ceramic 1 and produce a very weak magnetic field. SM Magnetics, the engineering and manufacturing sister company of SuperMagnetMan, has been assisting Corporate customers for many years with their custom ceramic disc magnet applications. This includes material selection and optimization for applications such as motor magnets, sensor magnets, and holding assemblies. Or, if you need assistance from SuperMagnetMan and its technical magnet staff with your disc magnet requirement, Contact us, or use our online custom magnet quote form to start the discussion.